A bit of modeling and rigging anyone? I was thinking perhaps I should still keep up my other skills, modeling and rigging. 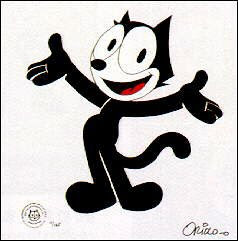 So thinking today I was like *light bulb* my girlfriend gave me a cool Felix the cat wallet the other day. Why not model (which should be simple) and rig (which should be harder) a Felix! That way I can get a better feel for Maya. I'm not very familiar with it, so I need to learn. I am very familiar with Wings3D and 3ds Max. I know Blender pretty well, and can do the basics in Mirai, XSI, Lightwave, and Maya. Maybe a few others too. I have used many and owned a few of these softwares. I am quite partial to Wings3D. Blender is pretty freaking awesome for free, and XSI's sub-d's are superfast. Lightwave is just weird. It looks really cool, but it's so awkward. Mirai is an also dead application that still has things other software dream of. I can't see why it's still hard to do these things with today's applications. I mean 3d paint, auto-ik, and a morph system so powerful you wouldn't believe me if I told you. Bay Raitt is one of the few people who know how to make it shine. If you have seen Gollum from the Lord of The Rings you know what I am talking about. He created the facial shapes or expressions for Gollum. Quite impressive and really realistic. He captured Andy Serkis' perfectly! Anyways enough rambling. I will post up my latest progress later this week. I will also try to post more stuff here. Like side projects and maybe a bit more personal stuff. Who knows. Comments are appreciated. But if you aren't registered, sorry but I don't think it's allowed. That's to keep spammers off of my comments.